Several high-ranking officials from Russia and India to attend the handover ceremony at the Yantar Shipyard in Kaliningrad. 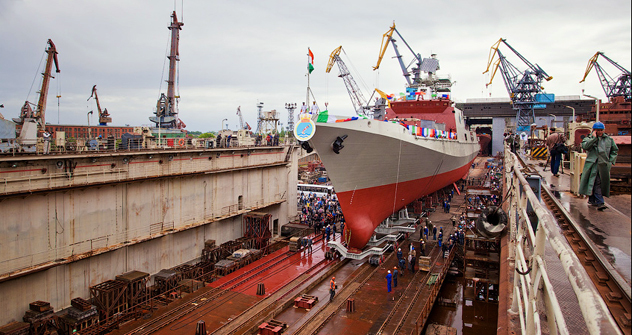 The second of three stealth frigates that Russia is presently building for India at the Yantar Shipyard in Russia’s Baltic exclave of Kaliningrad is being handed over to the Indian Navy today. Sergei Mikhailov, a spokesman for the Yantar Shipyard, said the solemn ceremony of delivering the INS Tarkash warship will be held in Kaliningrad and be attended by high-ranking military officers both from Russia and India. Russia and India signed a $1.6 billion contract on construction of three modified Krivak III class (also known as Talwar class) guided missile frigates for India in 2006. The first frigate, INS Teg, joined the Indian Navy on April 27 and arrived in Mumbai in June. The new frigates are each armed with eight BrahMos supersonic cruise missiles. They are also equipped with a 100-mm gun, a Shtil surface-to-air missile system, two Kashtan air-defence gun/missile systems, two twin 533-mm torpedo launchers, and an antisubmarine warfare (ASW) helicopter. The Talwar Class frigates are jointly produced by Russia and India and have a few Indian-origin systems, such as the anti-submarine sensor suite and complete communication equipment. The frigates have a displacement of 4,000 tonnes and a speed of 30 knots and are capable of accomplishing a wide variety of missions, primarily, finding and eliminating enemy submarines and large surface ships. The INS Talwar, INS Trishul and INS Tabar frigates were the first 2 Talwar class frigates built in Russia. Several reports in the India and Russian media have indicated that the countries are holding negotiations for the construction of another 3 frigates; this would increase India’s total number of Talwar class frigates to 9. RIR's Sergei Ivanov contributed to this report.